The Marydale Project is a virgin gold discovery of possible high sulphidation epithermal origin located 60km from the Prieska Project. In November 2015 the Company announced the signing of a binding term sheet giving Orion the right to acquire the unlisted company, Agama Exploration & Mining (Pty) Ltd (Agama), a South African registered company which through its subsidiary companies, ultimately holds an effective 73.33% interest in the Prieska Project and the Marydale gold project (Option). The commercial terms were revised in May 2016 and are detailed below. The projects have a well established Broad Based Black Economic Empowerment (BBBEE) ownership structure (26.66% ownership) in place with strong local partners. Marydale was initially discovered by Anglo American Prospecting Services (AAPS) during exploration primarily focussed on Cu-Zn mineralisation between 1978 to 1981. 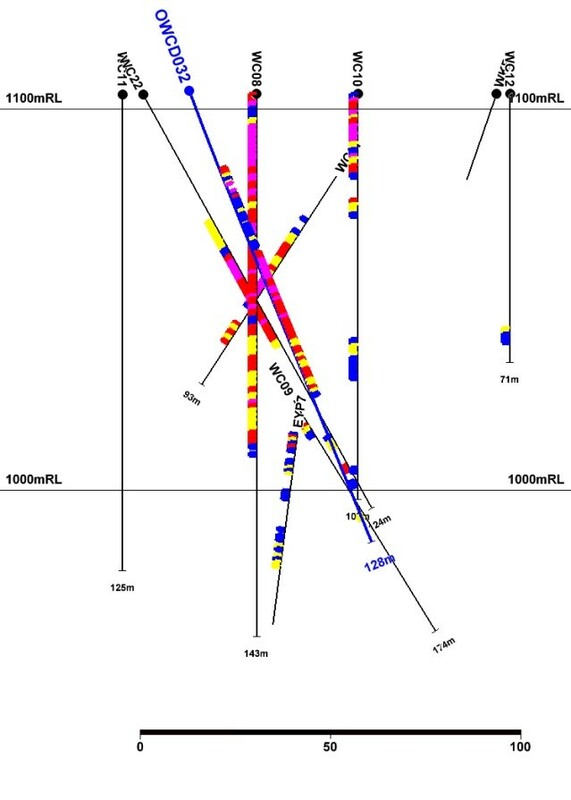 Exploration included geophysical and geochemical surveys (IP, ground magnetic, soil and sub calcrete sampling) as well as 732 shallow scout percussion holes for 1,600.5m, followed by 13 deeper percussion and diamond holes for 2,011.2m which tested induced polarisation (IP) and geochemical anomalies. AAPS returned to site between 1988 and 1989 to assess the potential for gold mineralisation in the area. This exploration phase included a programme of trenching, pitting and drilling. Drilling included 157 shallow percussion scout holes, four diamond holes for 329m and seven other holes for 193m. Like many others in the belt the project was relinquished due to prevailing economic circumstances with the next phase of work was carried out by Agama between September 2011 and May 2013. Following review and confirmation of AAPS results 74 percussion holes for 3,056m were followed by 31 diamond holes for 3,341.1m being drilled. 12.1 metres at 2.37g/t gold from 56.2 metres & 27.4 metres at 2.18g/t gold from 72.6metres (WC01). 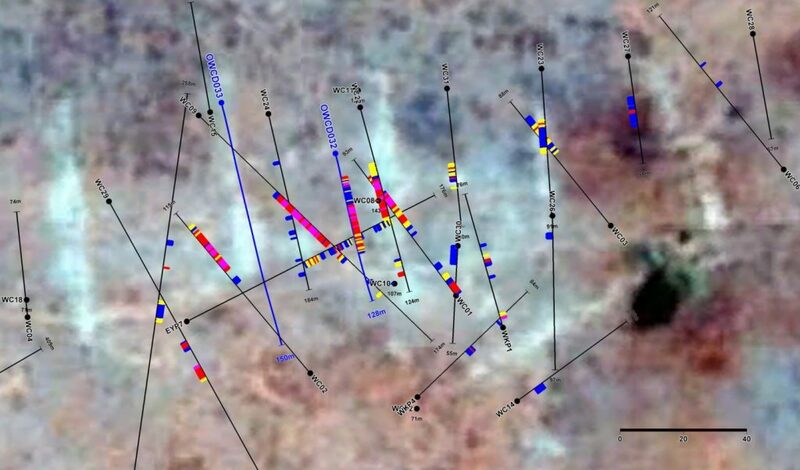 However historical drilling following the discovery was carried out in various orientations and, despite wide zones of mineralisation being returned, the majority of these intersections are now seen to be at sub optimal orientation. 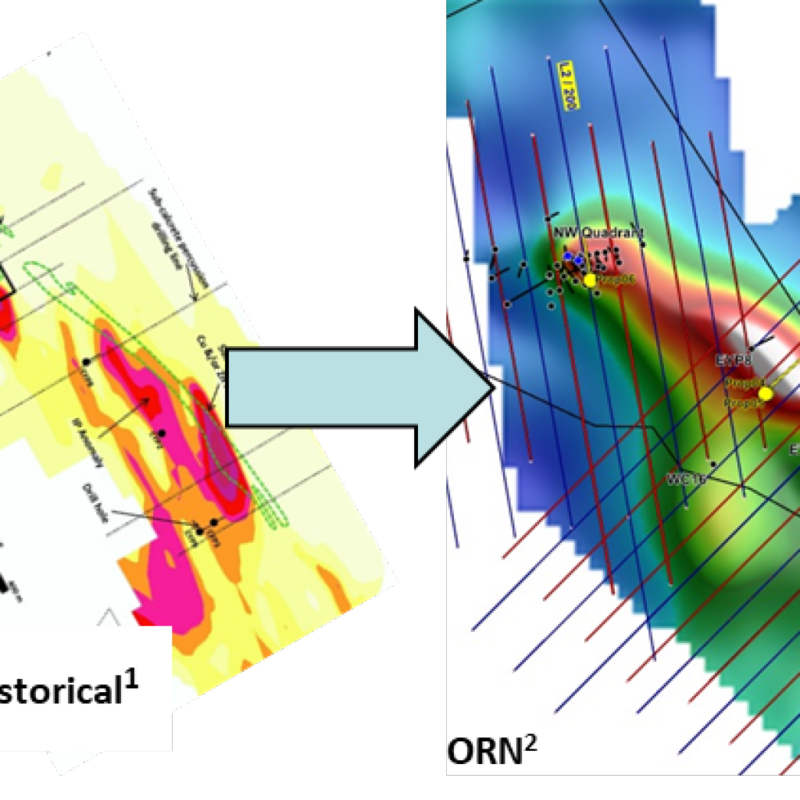 Orion’s recent drilling has focused on obtaining oriented drill core through the higher grade zones intersected in historical drilling. Structural geological data from these holes is being used to generate a robust geological model for the prospect. 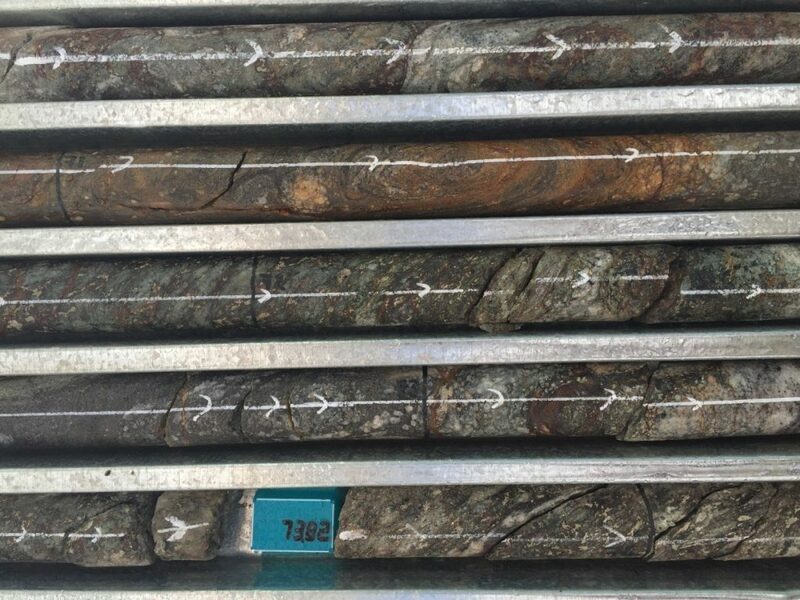 Assay data has been received from OWCD032, the first of the two completed drill-holes at Marydale, with a thick intersection of 64m at 1.55g/t gold and 0.26% copper returned from 22m down-hole. This intersection includes a higher grade interval of 21m at 2.93g/t gold and 0.34% copper including 5m at 5.09g/t gold and 0.37% copper (see Figures 1 and 2). The broad zones of mineralisation intersected in this hole are consistent with historical drilling. 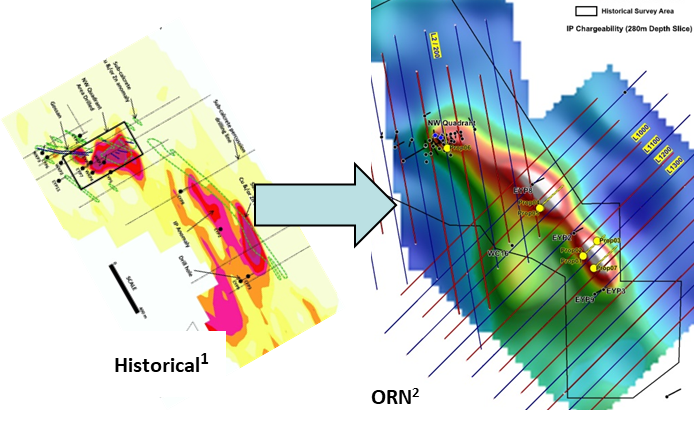 Figure 1: Plan showing results from OWCD032 and historical drilling at the NW Quadrant area of Marydale Project. 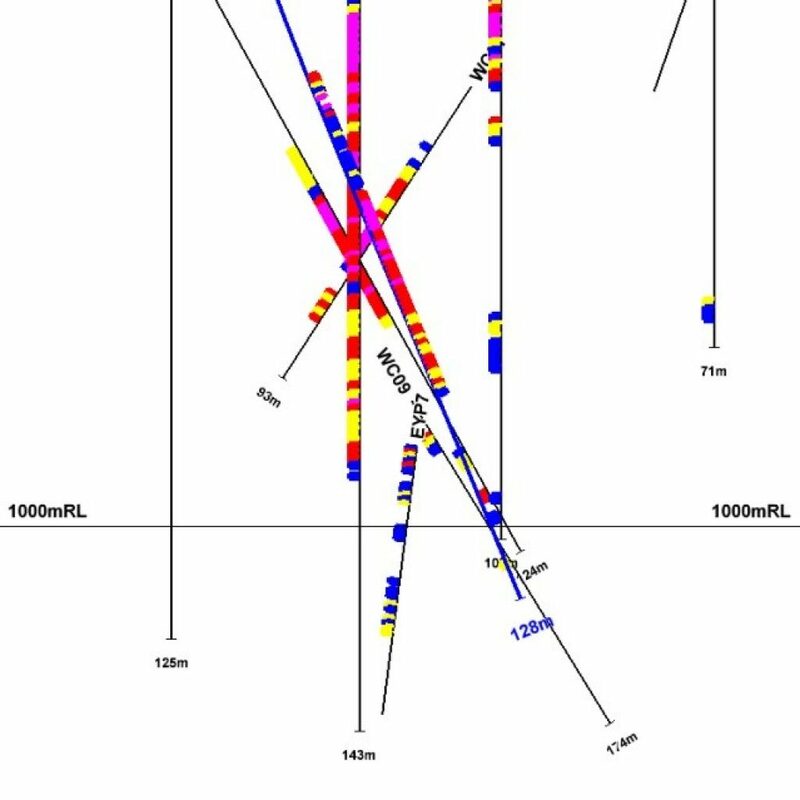 Figure 2: Cross Section showing results from OWCD032 and adjacent historical drilling. Initial interpretations based on data from the oriented core have made it clear that the host lithology is in a structurally complex folded and sheared package. Significantly, multiple zones of elevated mineralisation were intersected in OWCD032, which may imply a repetition of the mineralised strata due to folding or faulting. Individual lenses of mineralisation may also be fault or shear bounded and terminate abruptly (Figure 3). Structural data is being collected and interpreted for input into the geological model and use in targetting follow up drilling. 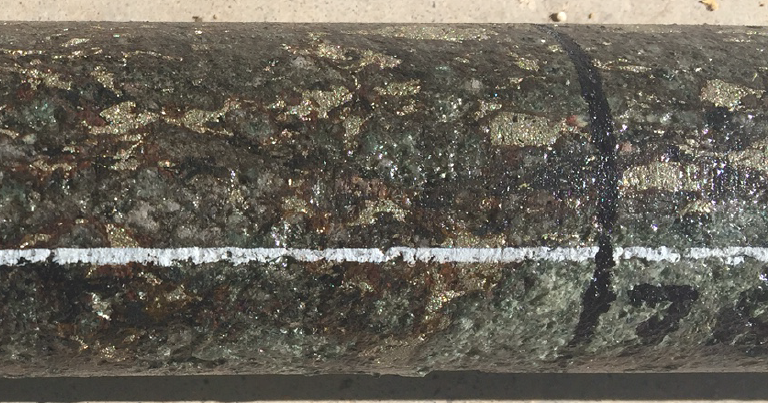 Figure 3: Highly mineralised core intersected in hole OWCDO33 between 70m – 74m. Pyrite (5%-15%) is partially oxidised to haematite and limonite at this depth. Lithology is structurally complex, folded and sheared. The white line marks orientation reference line. Most importantly, a strong correlation between gold-copper mineralisation and sulphide content (reaching >25%) is observed (Figure 4), indicating that electrical geophysical techniques may be used to identify accumulations of mineralisation and placing higher significance on historic induced polarisation (IP) survey data, which indicates an extensive conductive body (Figure 5). Figure 4: Highly sulphidic, blebby and net-textured sulphides associated with elevated gold-copper mineralisation, indicating suitability for EM detection. As at the end of 2016, the Company completed 4 holes at the Marydale project, testing a semi-continuous arcuate chargeability anomaly extending some 1.7km from the previously drilled NW Quadrant area, which was mapped by the Company’s high-powered 3D induced polarisation survey. 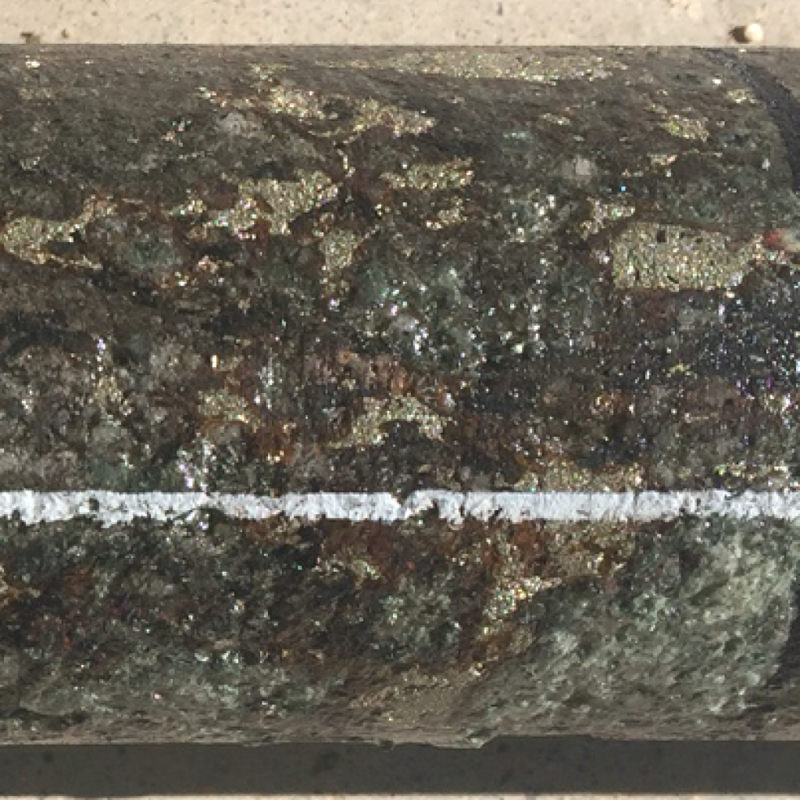 Drilling intersected several zones of disseminated sulphides, a number of which returned anomalous levels of copper and gold in assays.